The 4:55pm HSC to Union Station will not run. Please catch the next bus at 5:00pm. Sorry for the inconvenience. Effective February 11, 2019, the 7:25pm and 8:35pm Soto-HSC-Intercampus Shuttle route times have been discontinued. If you need service from Soto to the Intercampus Shuttle Bus Stop on San Pablo after 6:00pm, please contact HSC Campus Cruiser at 323-442-2100. The Watt Way Entrance will be closed for construction from Monday November 26, 2018 through May 2019. The following Bus Stops and Routes will be affected: The Vivian Hall (VHE) Bus Stop for City Center and Parking Center on Watt Way will be moved to Michelson Hall, on McClintock just south of Childs Way. The Parkside Residential Building (PRB) Bus Stop for Marina Del Rey on 37th Pl will be moved to Michelson Hall, on McClintock just south of Childs Way. We apologize for any inconvenience, and please check our website for important updates. Service from 7:00 AM to 9:20 PM, Monday-Friday. Shuttles depart from JEP House and also pick up at 34th Street and McClintock. 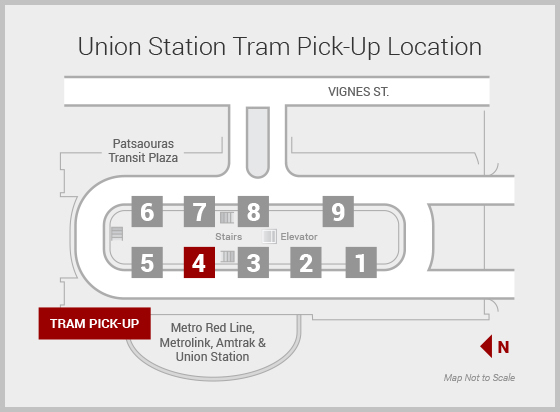 All shuttles stop at Union Station with the exception of the 7:30 AM departure. Shuttles depart from JEP House and also pick up at 34th Street/McClintock. Hourly service from 7:40 AM to 5:40 PM Monday-Friday. Board the shuttle at City Center (ATT) on Olive St.
Departs from Leavey Library on the :05 and :35 from 6:35 AM to 10:05 PM Monday-Friday. Service from 7:00 AM to 10:05 PM, Monday-Friday. Prior to 3:00 PM, all service is provided by the Intercampus Shuttle. Between 6:05 PM and 9:20 PM, all service is provided by the Intercampus Shuttle. Service from University Club every hour at 25 minutes after the hour, from 7:25 AM to 5:25 PM, Monday-Friday. Service from Michelson Hall every hour at 30 minutes after the hour, from 7:30 AM to 5:30 PM, Monday-Friday. City Center (Formerly ATT Building) on Olive St. Bus departs CAL then goes on to JEP House en route to Union Station. From 9:00 am to 4:40 pm, service is provided via Circuit Shuttle. Service from 9:00am to 4:40pm. Departs from Lot 71 every 20 minutes. Service from 7:00 AM to 10:05 PM Monday-Friday. Service from 6:15 AM to 6:00 PM, Monday-Friday. Buses depart Soto I building every 15 minutes. Service from 3:10 PM to 5:40 PM, Monday-Friday. Board shuttle at Soto I building. Service from 6:10 AM to 10:15 PM, Monday-Friday. Board the shuttle at Patsaouras Transit Plaza, Berth/Station #4. Neither the Intercampus Shuttles (ICS) nor the 8:18AM and 8:42AM service CAL. Both the 8:18AM and 8:42AM drop at MRF only. All stops at UPC are Discharge Only. Service from 6:08 AM to 9:40 PM, Monday-Friday. Intercampus shuttles DO NOT stop at Soto. Some Union Station to HSC buses do not stop at Soto (see below for those times). Service from 8:00 am to 5:50 pm, Monday-Friday.